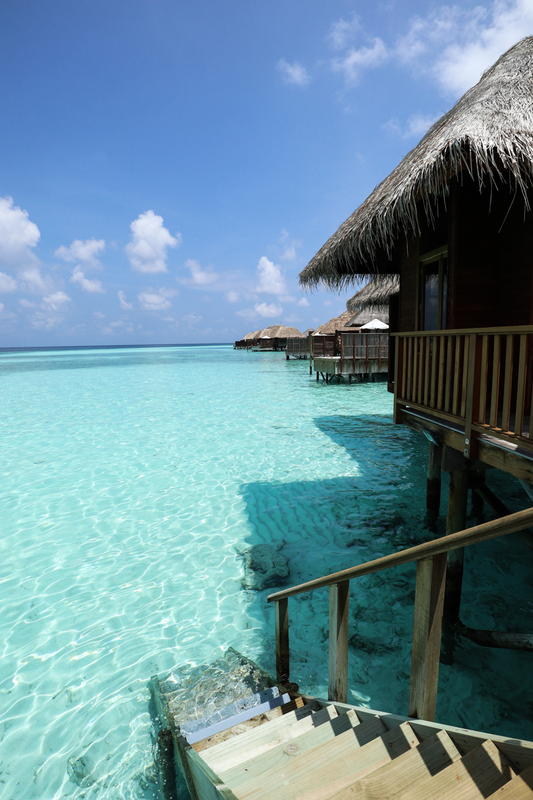 Waking up to the sound of gentle waves I take a few barefoot steps out of my bed and force my eyes into a squint at the splendour of the morning sunshine. 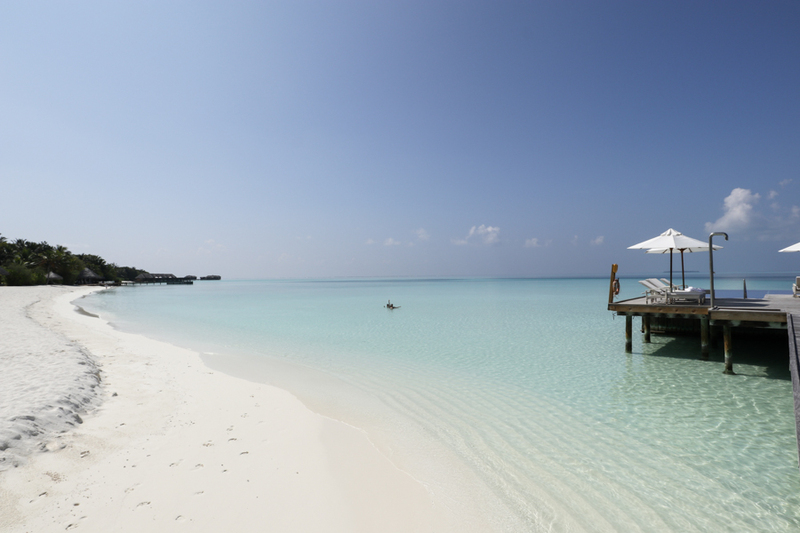 Once adjusted I’m greeted with the glistening views of pastel pinks settling on the crystal clear water beneath where I stand, I take in a deep salt-scented breath and thank the universe once again for another morning welcome at Conrad Maldives. 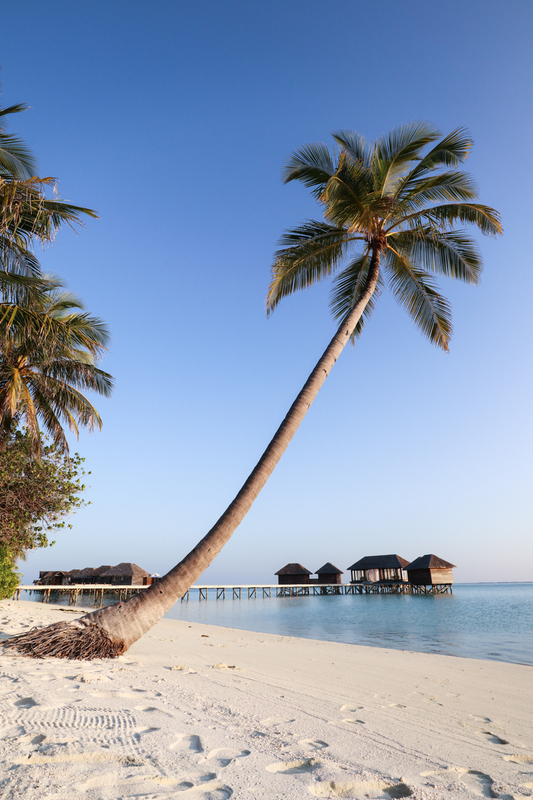 There really is no place quite like the Maldives. I’ve visited the dreamy destination now five times which asides from the US and Greece sets a record for me when it comes to repeat visits to any country other than my own. I was first introduced the wonder of the scattered islands on my honeymoon which was now seven years ago and the love affair was instant. 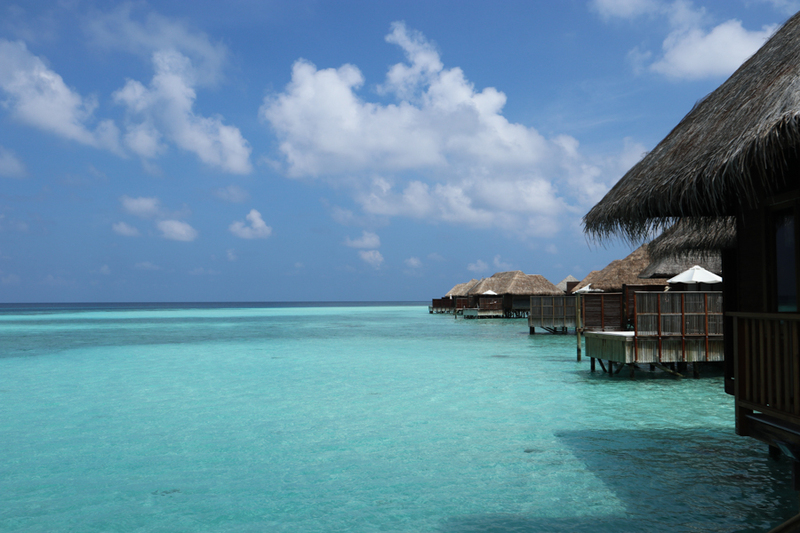 For those of you who haven’t had the luxury of travelling to the Maldives it is, in my opinion, like no other place in the world and having now visited 47 countries, I’m pretty confident in my assessment that it is one of the most beautiful places on earth. 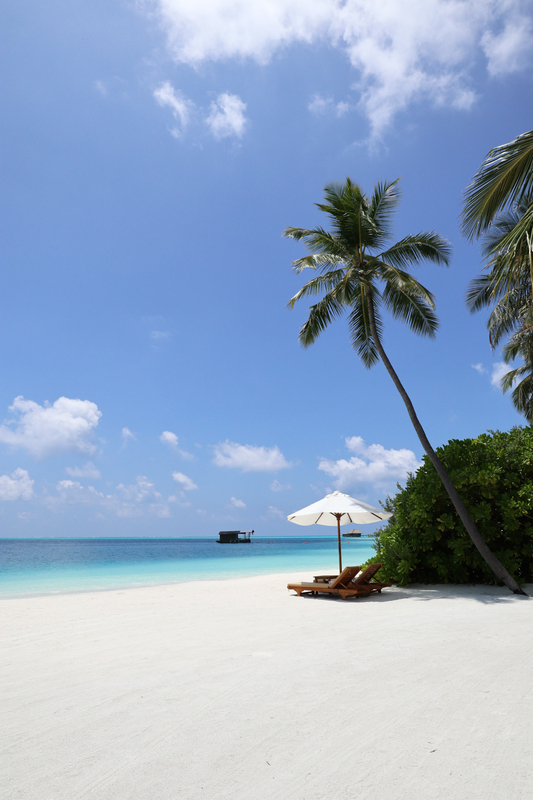 The iconic picture perfect beaches that you see splashed across centre folds in the travel glossies come to life and in the top tier resorts, the level of luxury knows no bounds. 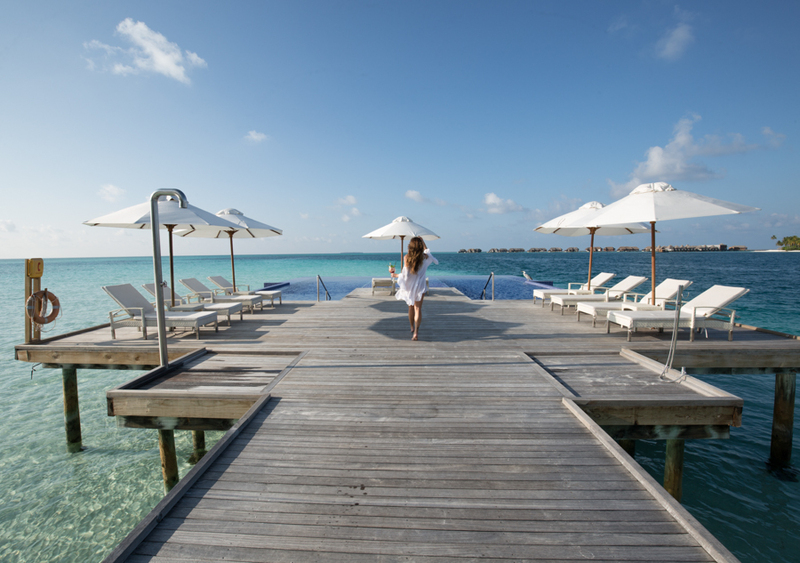 After my honeymoon taster trip, desperate to get back to the paradise isles I began collaborating with a hotel that I’m now (rather smugly) happy to call my island home from home, The Conrad Maldives and last month I spent my fourth week in one of the utopian villas within the Rangali resort. 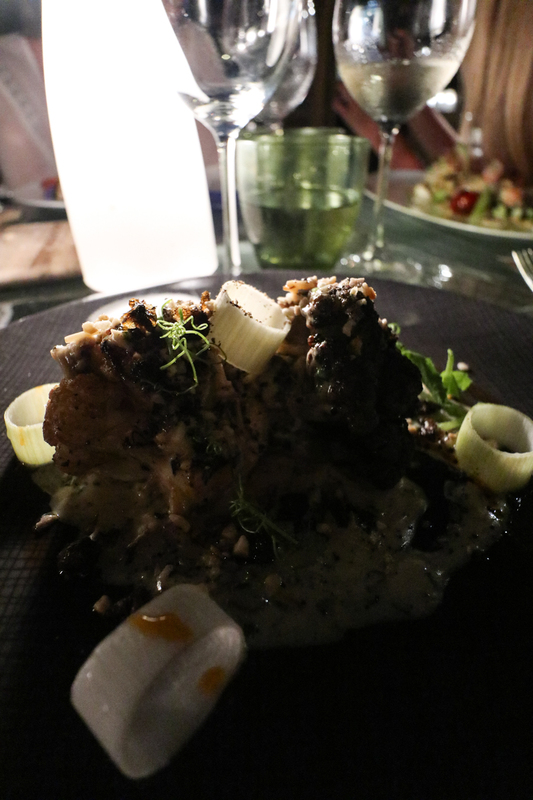 During this trip I also spent some time at another resort which was amazing for two reasons, one, my extended stay in the country and two, the comparison of luxury between the two resorts secured my given title to the Conrad as my all time favourite hotel. 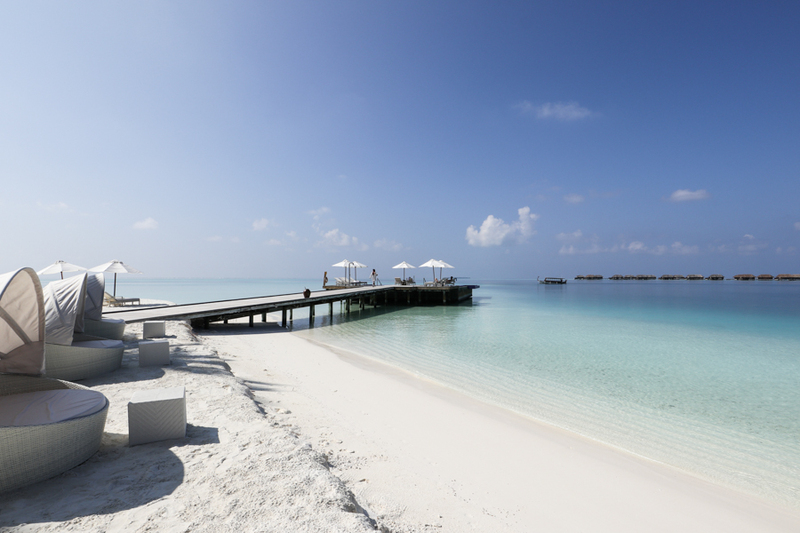 The stunning scenery of the surroundings will allow for any hotel to make a mark on your wandering soul but the limitless luxury offered by the team at Conrad really captures hearts for a lifetime for those who venture across to the idyllic country of The Maldives. 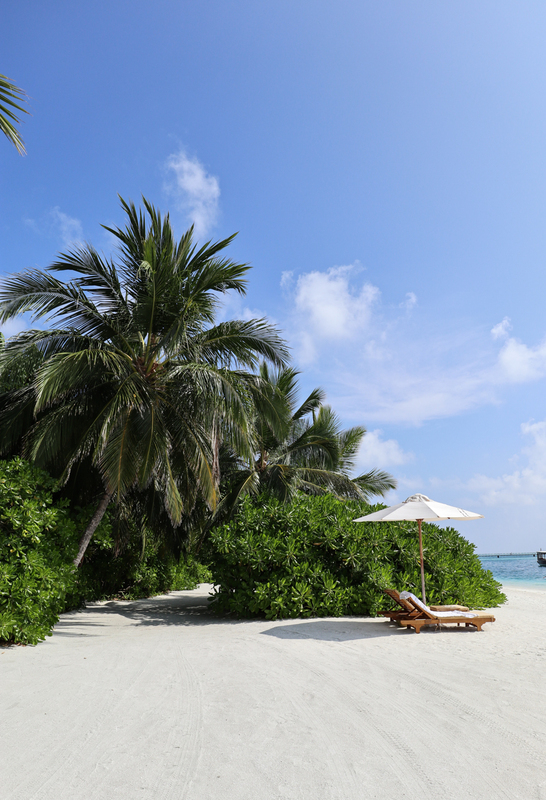 Working as a travel journalist both here on my blog and writing for a number of high profile lifestyle magazines it’s impossible for my expectations of five star, luxury resorts to not be high. I’ve been lucky enough now to enjoy some of the best hotels in the world when and whilst that’s an amazing sentence to personally scribe, it does also, make me a critic by default. 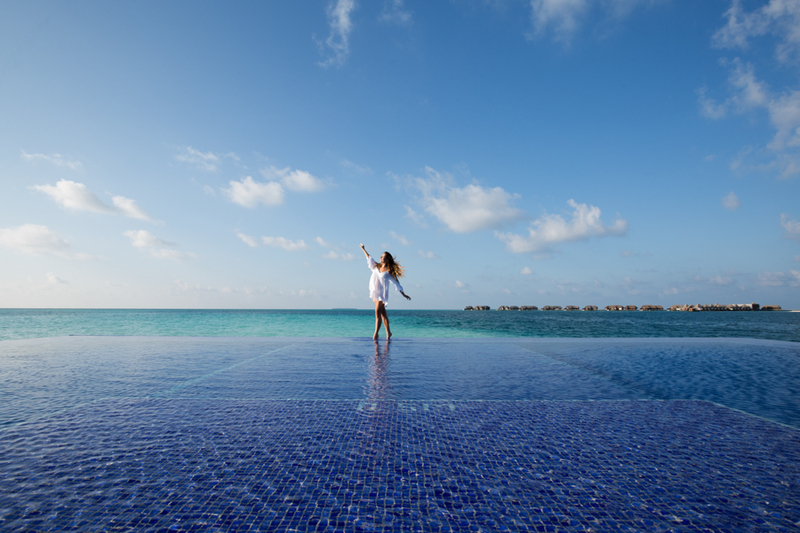 The smallest details are of the most importance to me and every single time I return to the Conrad Maldives my expectations are met. 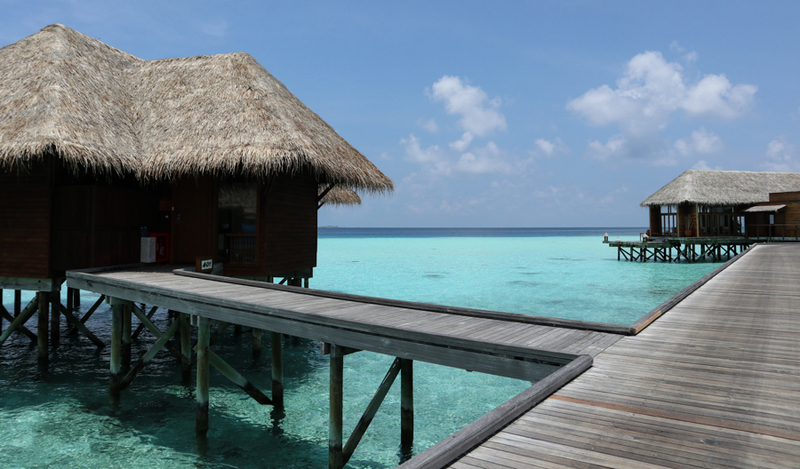 Now, two years on from my original ‘review’ post of the hotel that I’m honoured to have continued to work with and digitally praise since, let me take you around the magic of the two islands once again in written word. 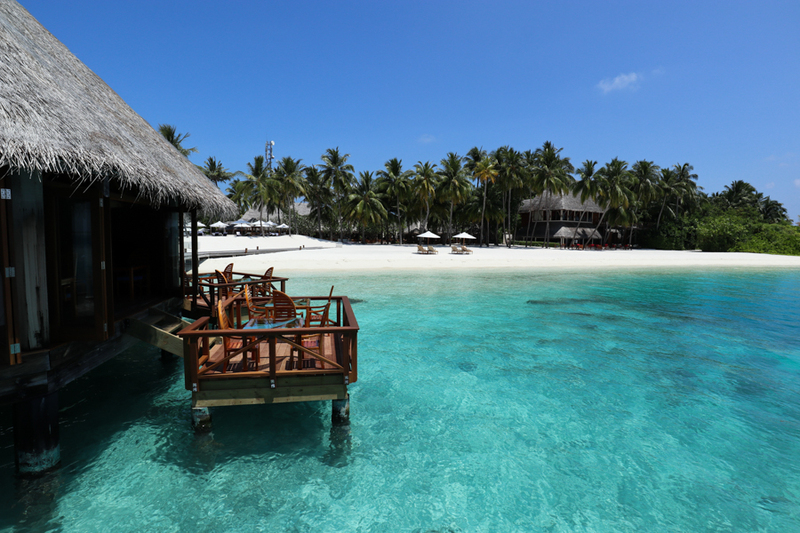 When travelling to the Maldives you’ll first fly out to the international airport of Male and once there you will have the option of taking a boat or seaplane transfer to your island of choice, this is mainly decided on by the location of your resort but some hotels also offer both options. 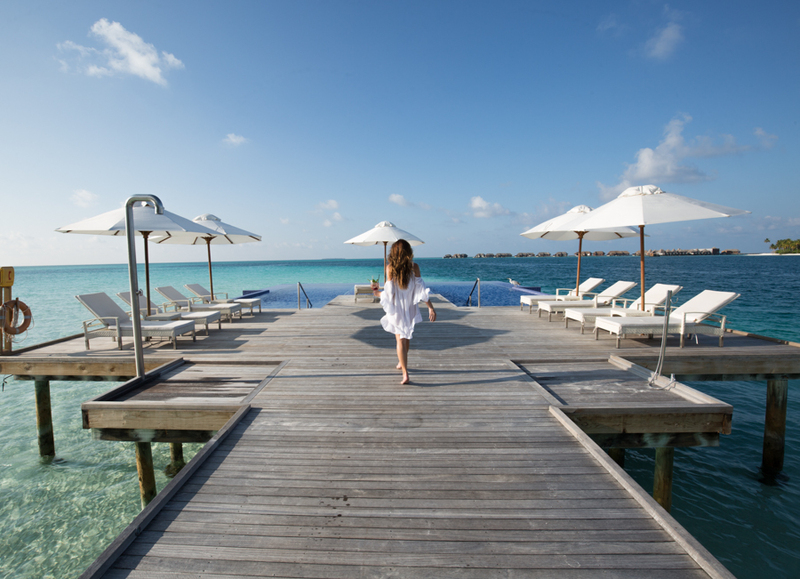 When it comes to Conrad the hotel is reached by air and your holiday starts from the moment you step off the international flight. After being greeted at arrivals by a Conrad representative you’ll then check in your bags for the sea plane and relax in the air conditioned transport that’ll whisk you off to the Conrad’s airport lounge where you can watch the novel planes take off, grab a shower, eat and drink from the open buffet or even sample a massage from the on-hand therapist before your internal flight takes off. 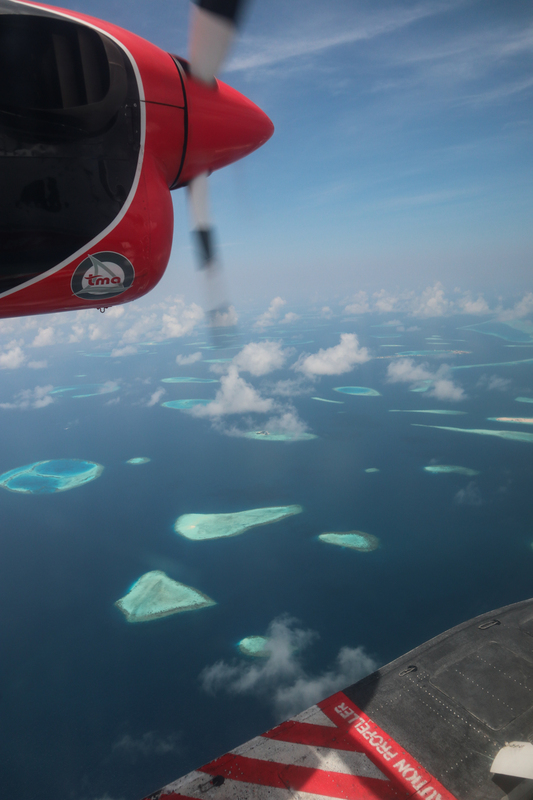 All you need to do is relax and let the team usher you to the plane when ready and once in flight (conquering any small aircraft fears) you are introduced to the wonder of the Maldives from the sky. 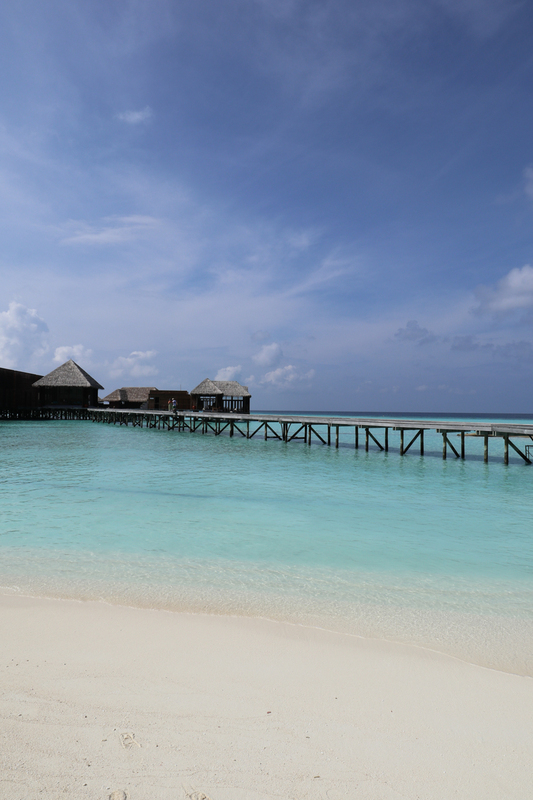 For first timers this is the time to take out the camera if you haven’t already reached for it as the drama of the turquoise colours with pockets of sandy seclusions and visible over-water villas from up above really is a treat for jet-lagged eyes! 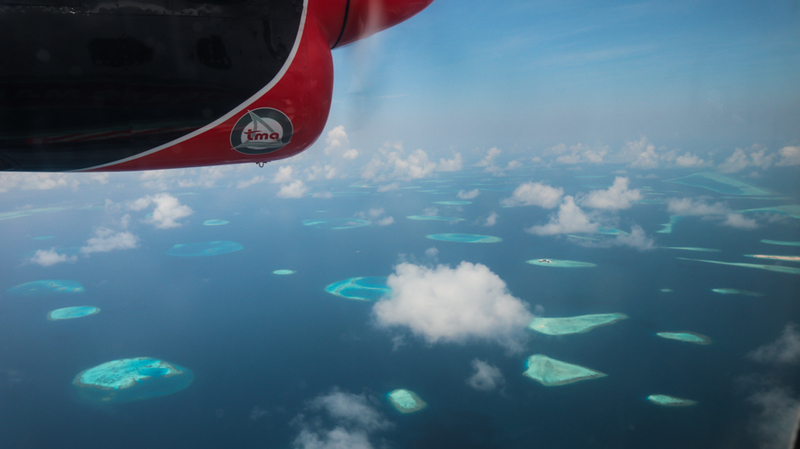 On arrival into Rangali island the fairy tale begins with the hospitality team waving you in from the sky. Once landed and your first sweet breath of warm air has been taken the arrivals team will welcome you on site with a frozen slush and excited smile. 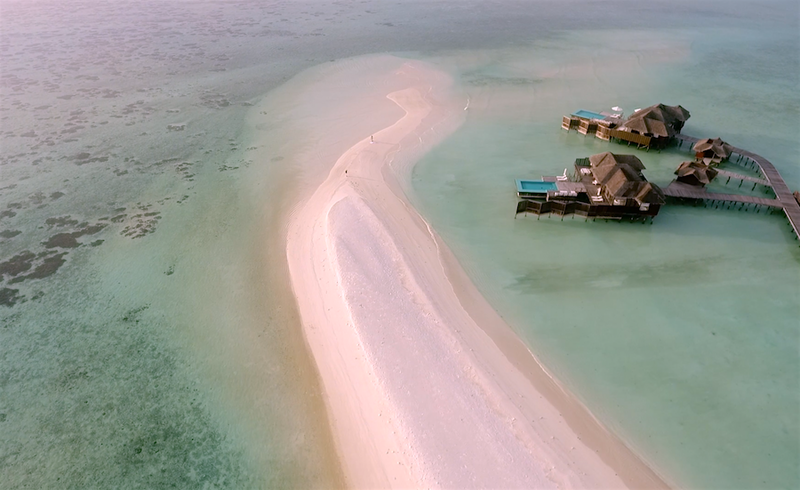 The resort is split between two islands and the sheer size of your playground for the week will immediately take you back! 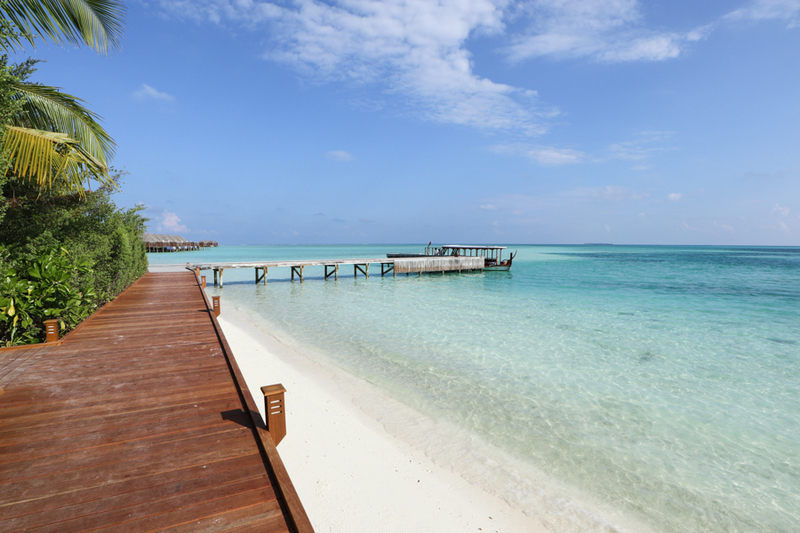 Wandering along the wooden wanderlust walkway to the main island reception the staggering beauty of your surroundings takes a while to sink in and this feeling of ‘this can’t be real’ will continue to stay with you as you discover more and more of the islands. 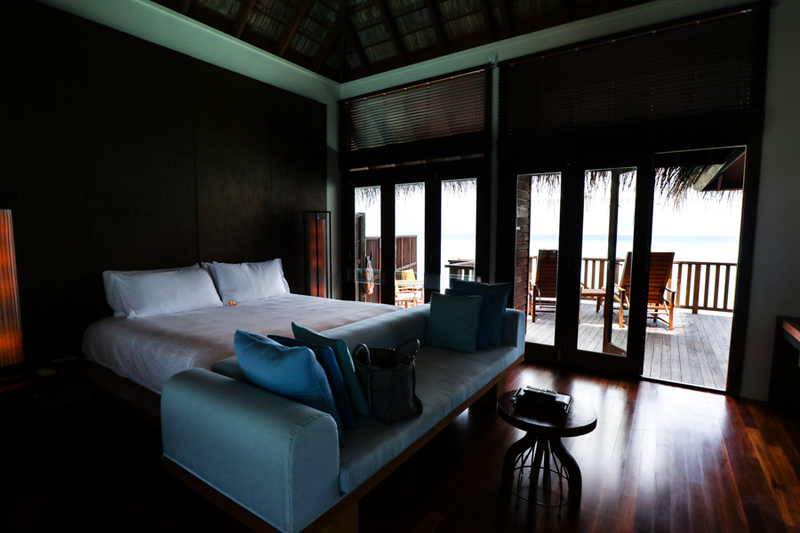 After check-in you’ll be shown to your haven in heaven for the next few days, your chosen villa for your stay. 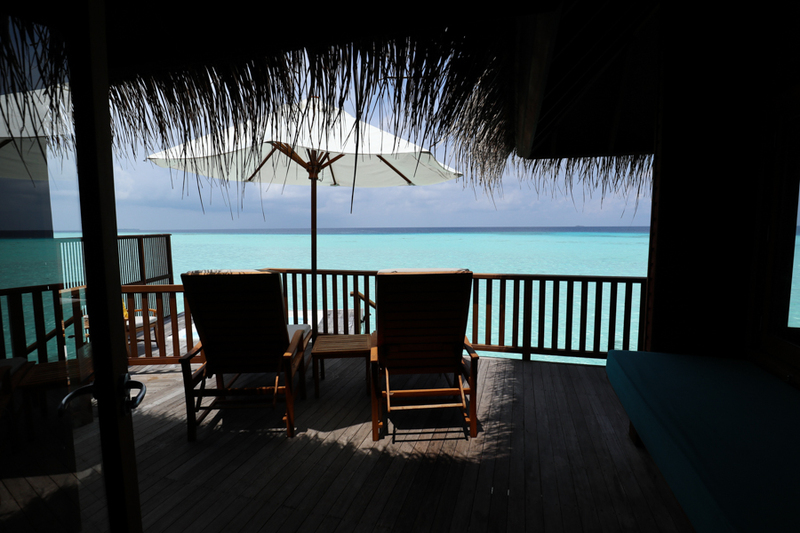 Whether you opt for one of the dreamy beach villas a spa water retreat or one of the deluxe sunset water villas you’ll be blown away by the opulent living quarters you get to call home for a few days. 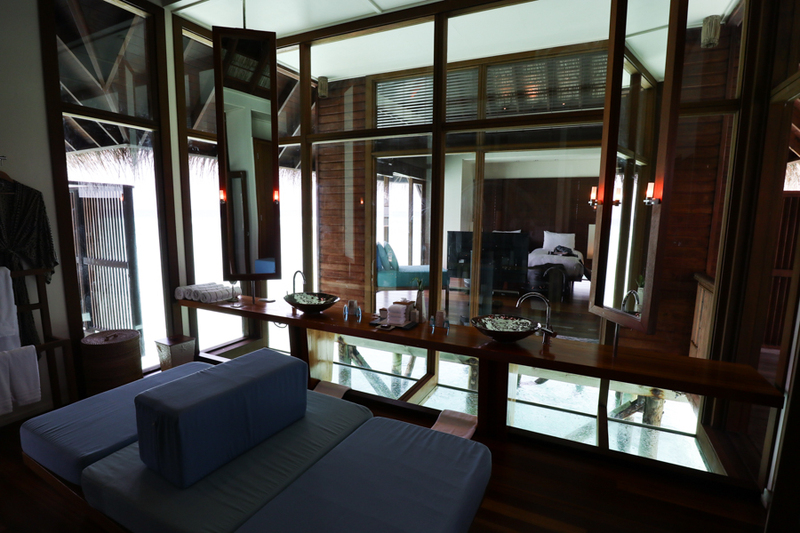 There’s a common theme of fresh open spaces and high ceilings at Conrad with all rooms showcasing perfectly the natural surroundings, whether that’s your few sandy steps to the beach from your bed or your swim up sea balcony into your star gazing bathroom. 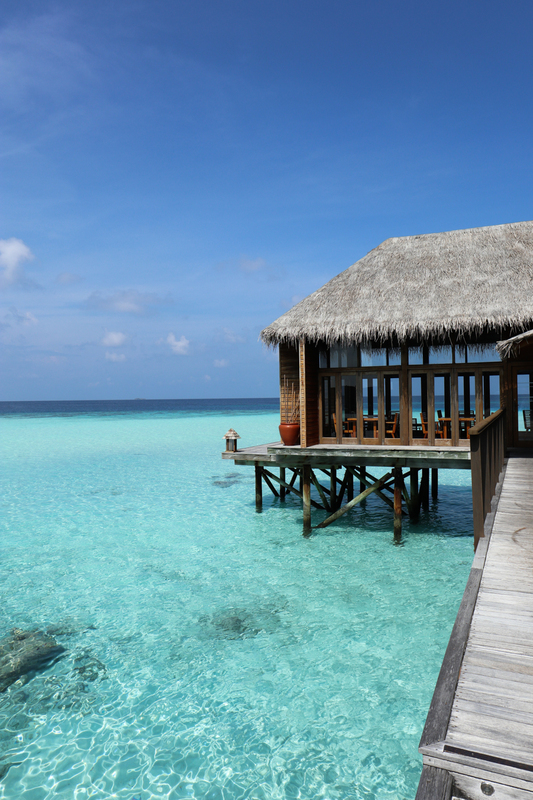 The choice is yours when selecting your room but my personal favourites are the deluxe beach villas which are the some of the dreamiest rooms I’ve seen in all my travels and of course the unique whimsical water villas, there really is nothing that compares to spending your evenings above the ocean and your mornings waking up to powerfully colourful sunrises on the horizon. 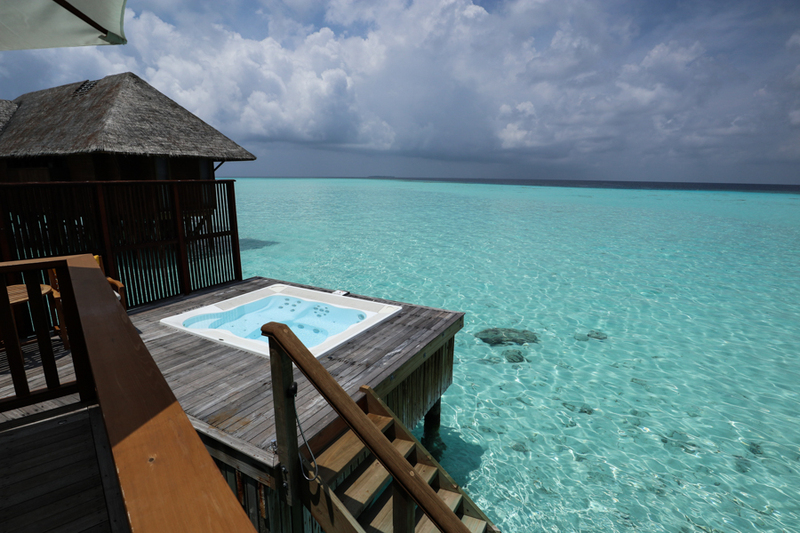 The resort boasts two large communal pools if your villa doesn’t feature a private splashing option and then there is the obvious Indian Ocean which is accessible at any point on both island fringes. 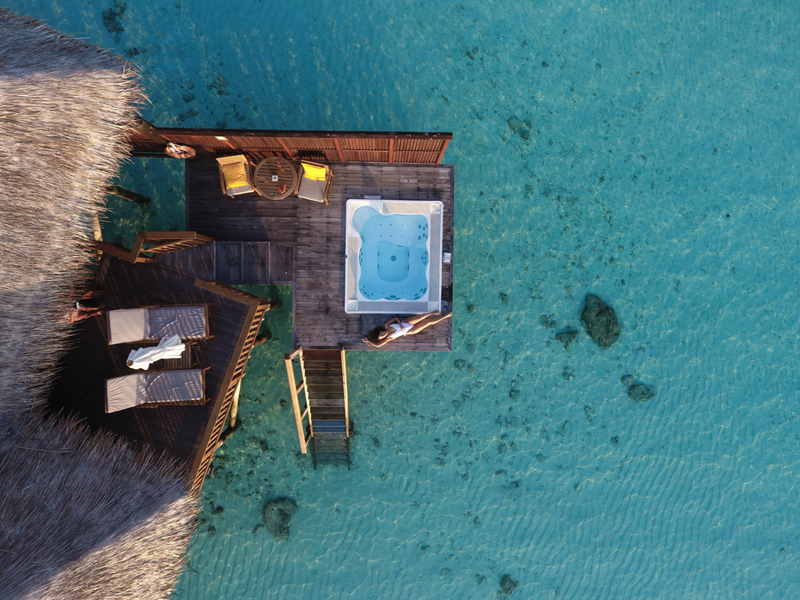 With dazzling clear waters and an actively inquisitive marine life in the house reefs my swims are always swam in the sea but having the option of two swimming pools is both a beautiful and practical touch for all travellers. My favourite however, by far is the quiet zone pool which is situated on the adults only island (did I mention one of the two is for us oldies?). 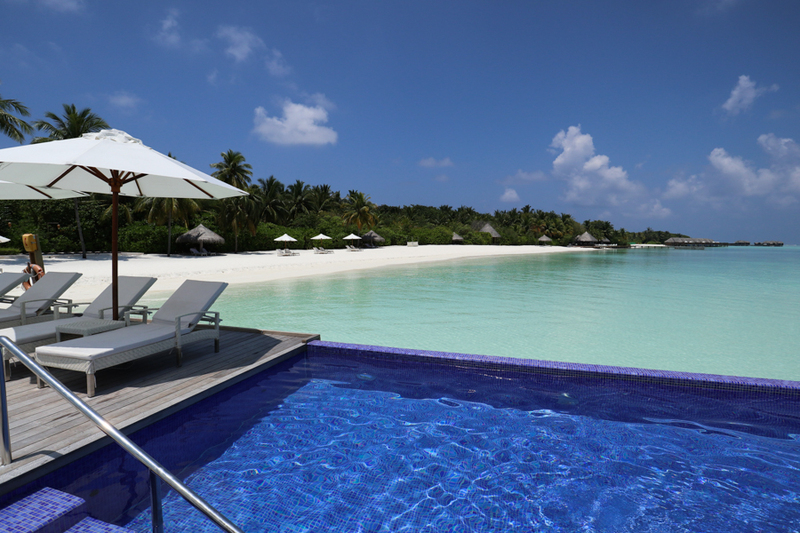 The atmosphere at this pool area is one that I haven’t yet been able to mimic in all my paradise adventures, set on the whitest sandiest beach of all with the glistening ocean as the foundation, the quiet zone pool is elevated above the water offering guests an infinity gaze over the Maldivian utopia. 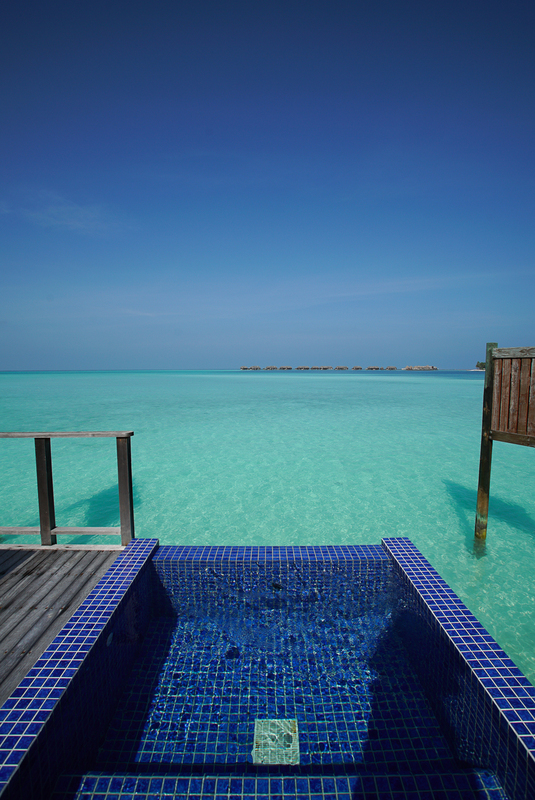 Here you can swim and enjoy the calm ocean serenity in ultimate opulence. 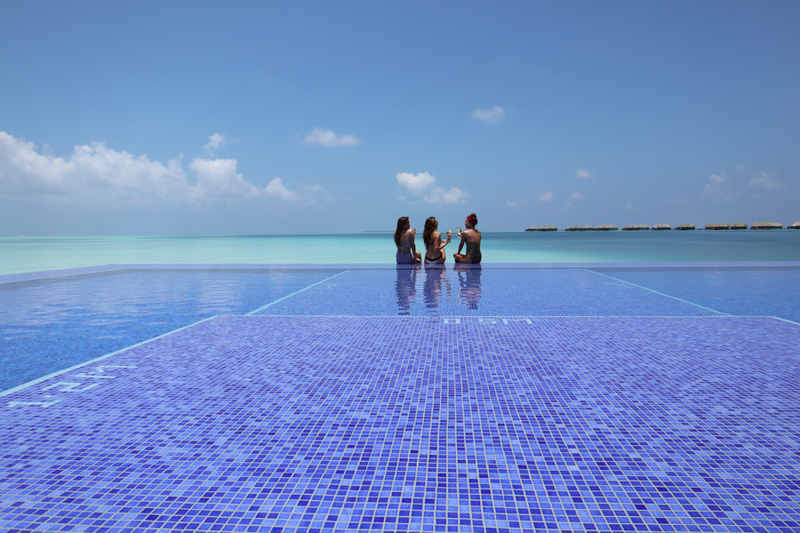 The pool rarely has more than a couple of visitors at a time allowing you precious private moments with one of the most dramatically beautiful views you will ever see. On top of the view and wet wander the quiet zone also offers an extensive list of cocktails to quite simply perfect the paradise moment with a sweet slurp and an unavoidable photo opportunity! 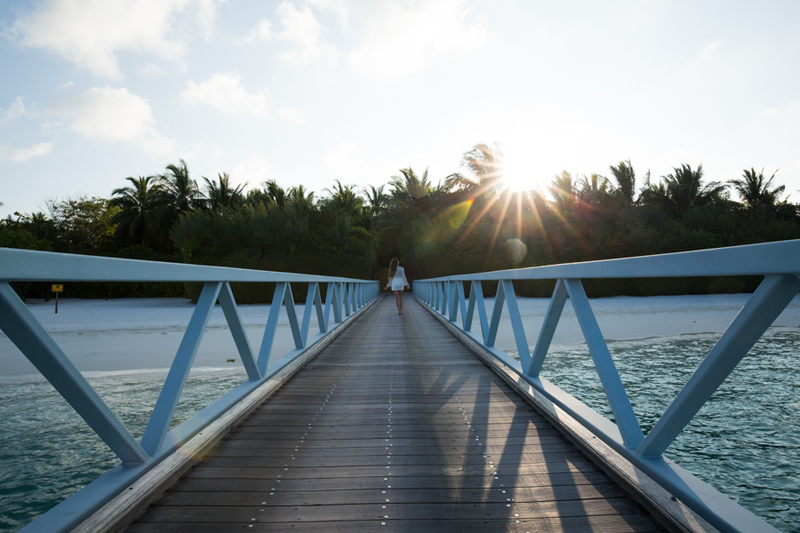 This side of the island is the perfect get-a-away for couples seeking romance as the sun says goodbye to the land and sea over the island’s private elongated sandbank here. 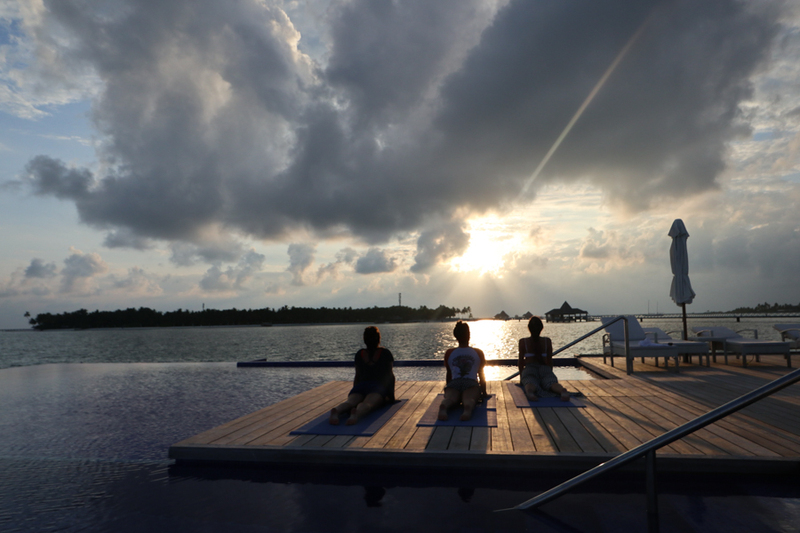 A small and scenic walk round to the island edge showcases the dreamiest skies of colour during the daily sunset and whether you opt to sit and stare at it or salute it away in a yoga pose the view is one that take’s your breath away. In contrast to the isolated romantic island Conrad’s main island is family friendly and a little more ‘alive’ as it’s here that most of the islands activities are based, the scuba diving centre which offers dives on-site and further out via boat, is situated here as it the grand selection of non-motorised and motorised water sports and the majority of the bars a restaurants. 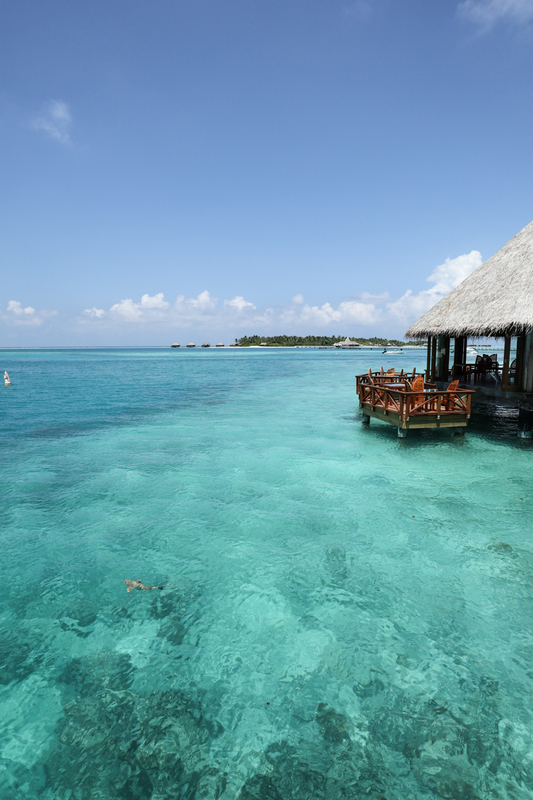 Contrary to popular belief there is so much to do in The Maldives and with a list as long as the cocktail menus of activities and excursions you wouldn’t be able to make your way through everything in just one week, so the choice of which to do is often the hard part. 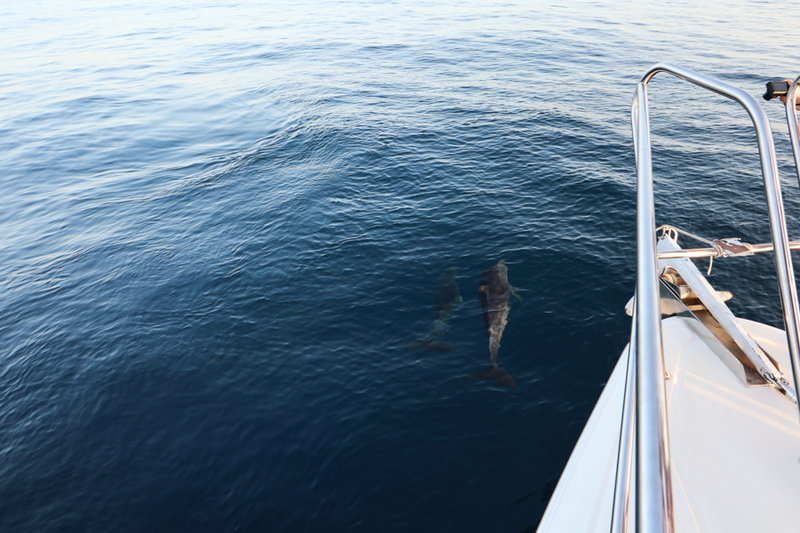 Some excursions are always re-booked by yours truly are they tend to always be the opportunities in which wild marine life encounters are highly possible. 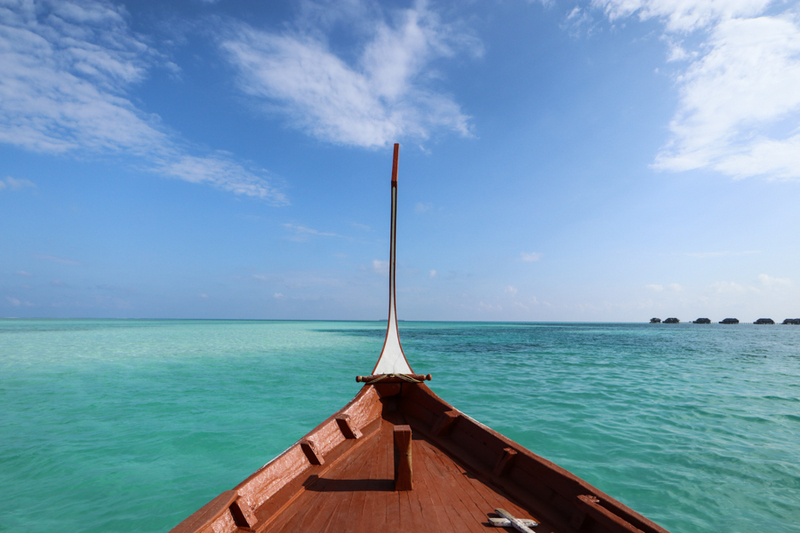 The sunset and sunrise cruises are a particularly great, you venture out to sea on either a yacht or traditional lavish sailing boat and as the possibility of seeing wild dolphins is extremely high in The Maldives you may be lucky enough to watch the majestic mammals jump, spin and swim along with you as you glide into the picture perfect sundance. 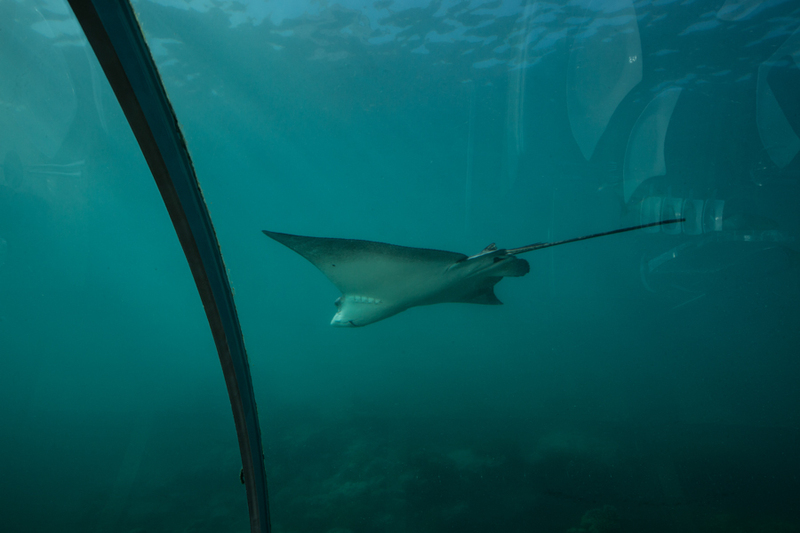 Another trip that I hold dear to my heart is the ‘Adventure Snorkelling Excursion’ this one takes out a small group of excitable swimmers to snorkel in reefs further out from the hotel’s location in search of a wider sea life variety. 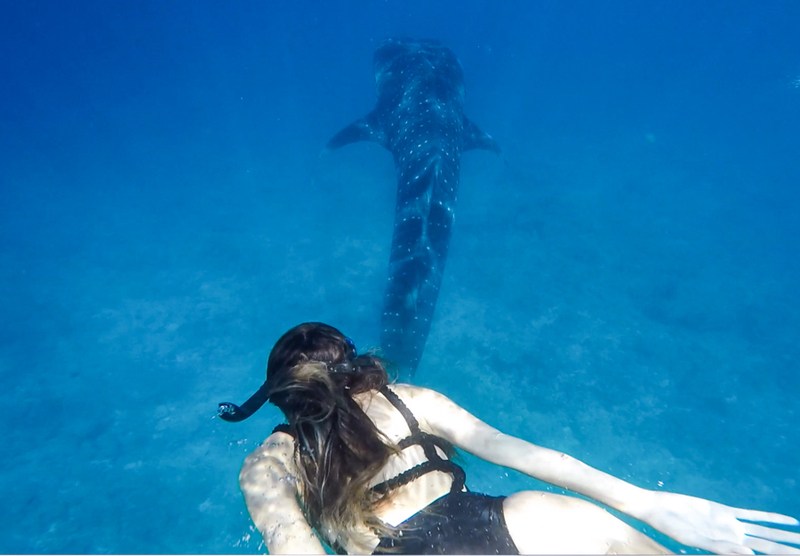 In appropriate seasons the search extends to seeking out wild whale sharks and if you are lucky enough to spot one the experience of gazing down at the largest fish in the sea as it therapeutically fins through the water is a true experience of a lifetime. 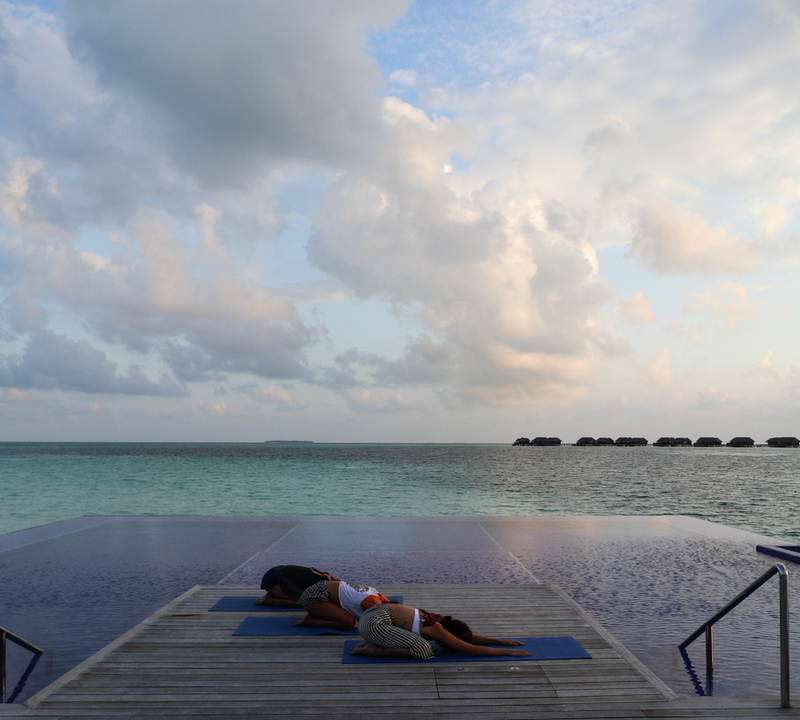 Stepping away from my beloved sea I am also a huge fan of an early morning or early evening yoga session and the Conrad’s resident yogi, Manesh, teaches two amazing classes a day offering those who join sun salutations with a difference! The location is decided upon each day depending on the weather and after an hour of stretching and breathing exercises I always feel refreshed and revitalised. 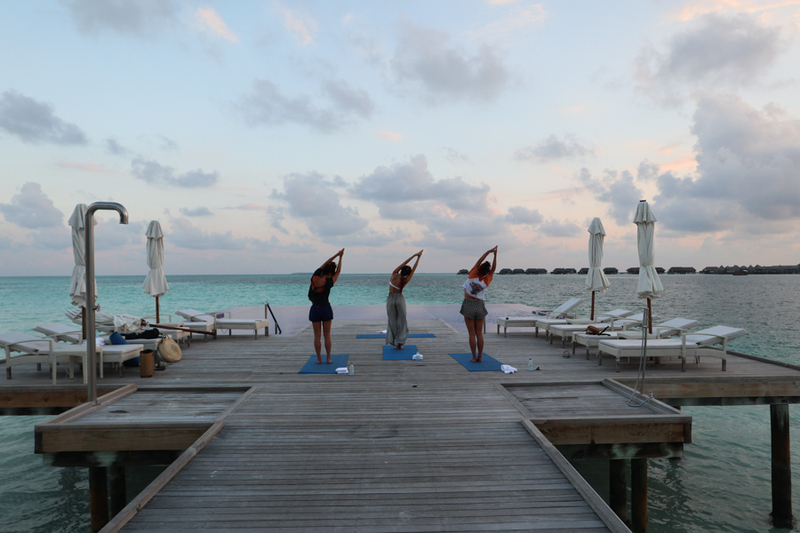 As an added bonus the meditative side of yoga helps connect me to the nature on the island and truly appreciate every moment, which in this day and age we can all attest is not always an easy thing to do. 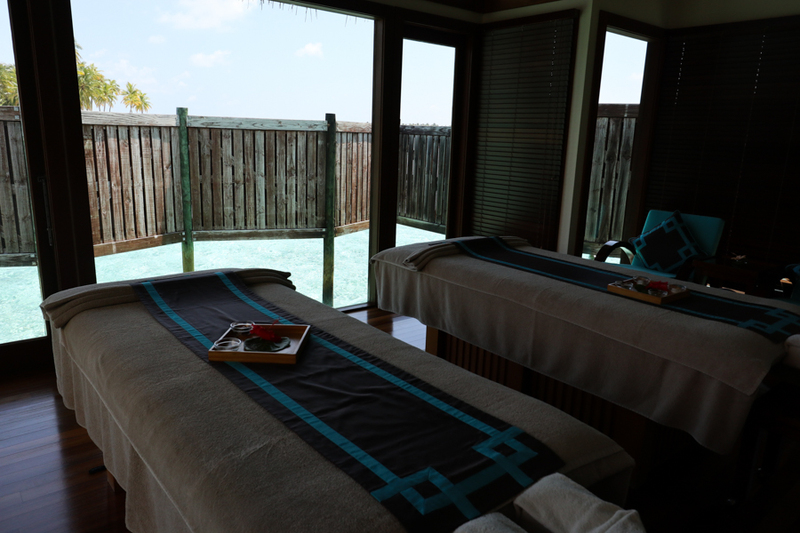 Both islands have their own spa offering sumptuous and varied therapeutic treatments, both are designed in the Maldivian unique style of being over the water and offer guests a treatment with a difference whilst enjoying the soothing sounds of the ocean below. 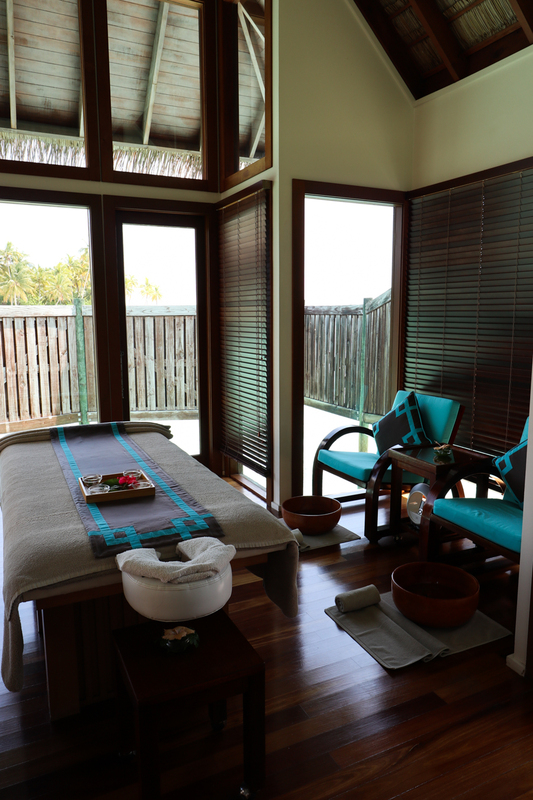 So should a day of adventures call for a calm down or a day of simply doing nothing call for a revitalisation, the spa has you covered. 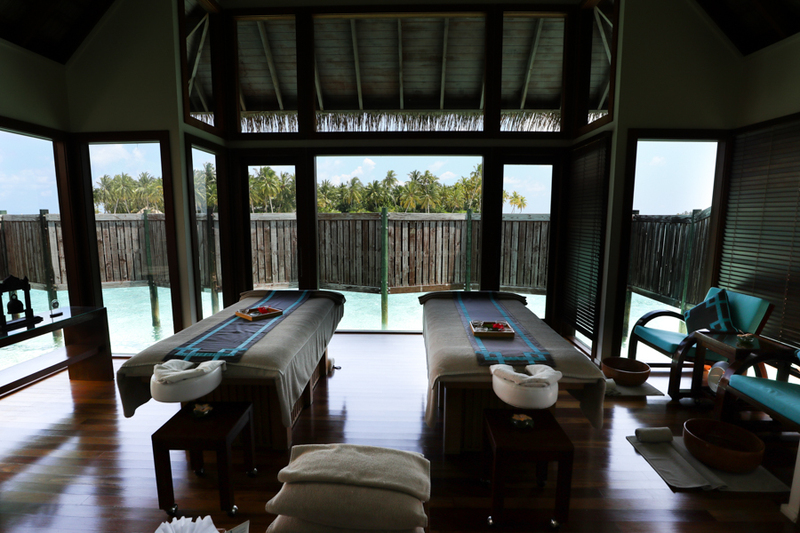 If staying in one of the over water spa retreats you needn’t even leave your room as a therapist can bring the spa to you. 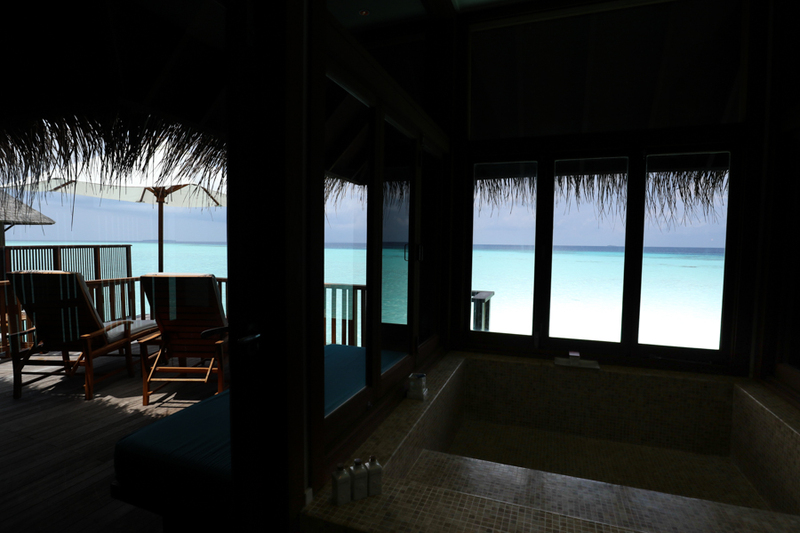 The kind of city wind-down escape dreams are made of! 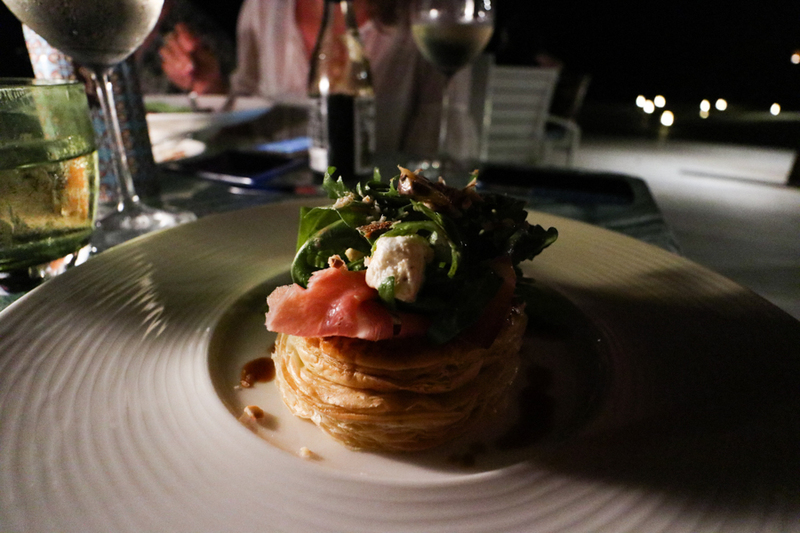 Covering your days activities and letting my photos do all the talking when it comes to the gorgeous scenery it’s now time to cover the food. 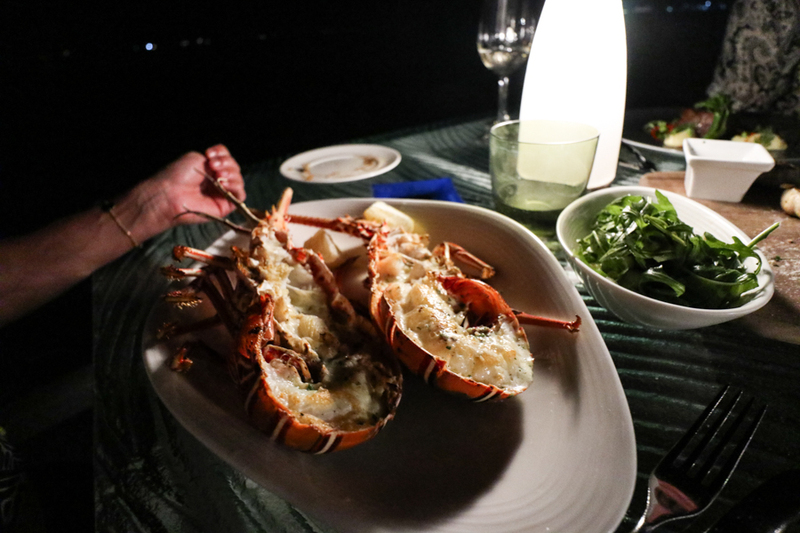 When it comes to fine dining at Conrad Maldives there’s more high end gastronomy options than in my home town of Grantham! 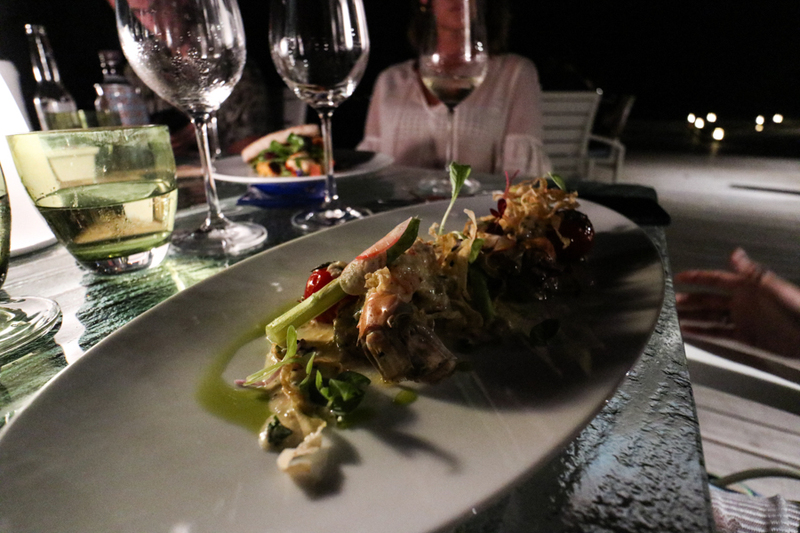 With the choice of 12 restaurants and bars it’s impossible to a) get hungry and b) not find something that suits your palette whilst switched off from the ‘outside world’ and isolated in the middle of the Indian Ocean. 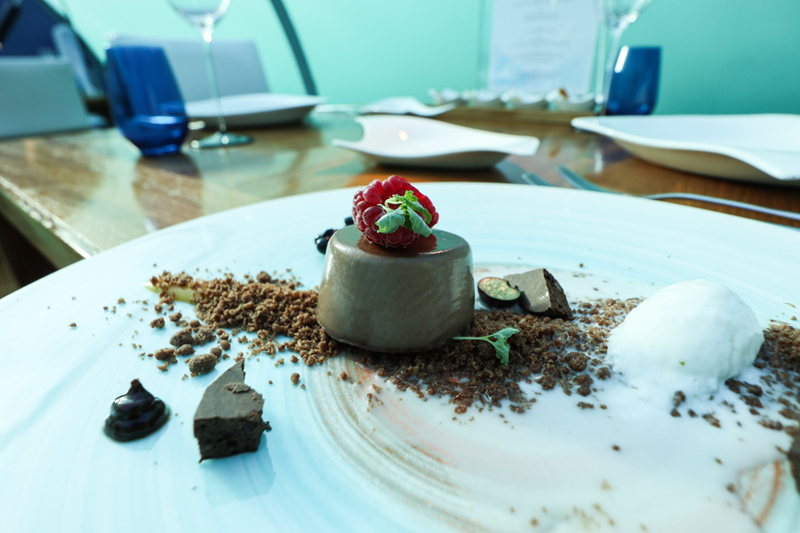 From an authentic Chinese restaurant to a cheese and wine bar, the long list of lust-worthy menus is almost too much to chose from but my personal favourites are Koko Grill where a ten course menu is served under the stars in an open teppanyaki beach restaurant to Sunset Grill where the setting of being over-the-water brings the deliciously decadent meals to life. 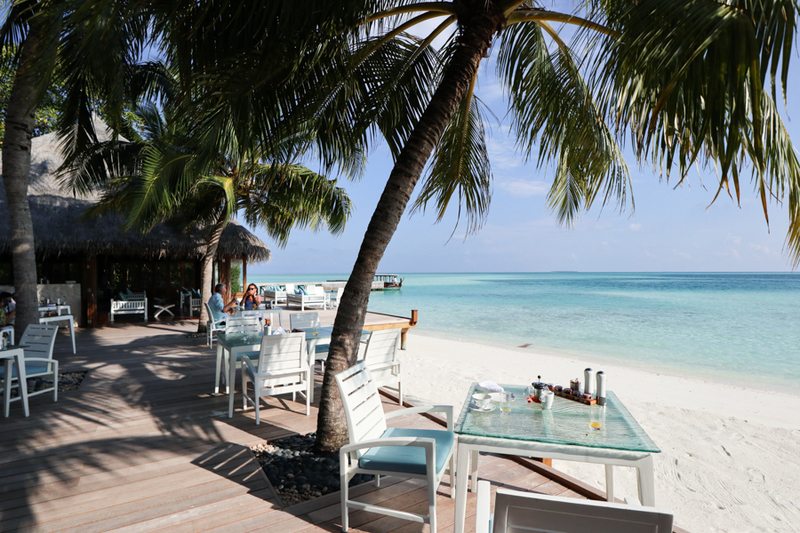 Mandhoo restaurant is the perfect daytime lunch spot, also situated over the water to woo guests and featuring a healthy menu for wellness seeking travellers and then Villu is a beautiful breakfast-by-the-sea option where your first meal of the day is a choice between buffet and/or a-la-carte. 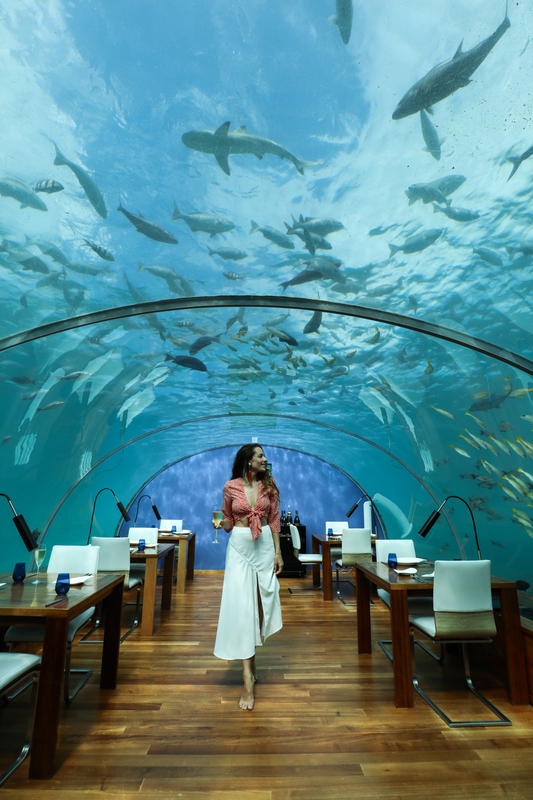 The truest wow factor restaurant though is, understandably, the remarkable Ithaa which as the world’s first under-the-sea restaurant has been stealing breaths from those who visit for years. 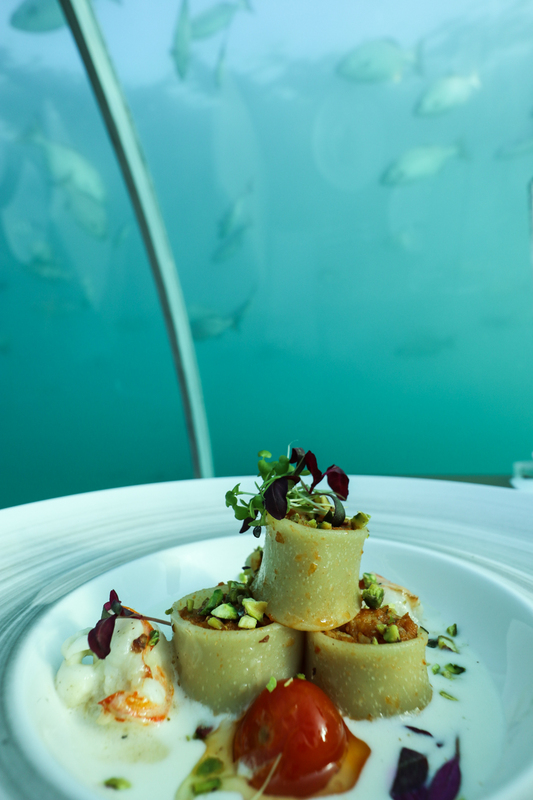 The glass structure is completely submerged in the lively ocean just a few metres from the main resort. 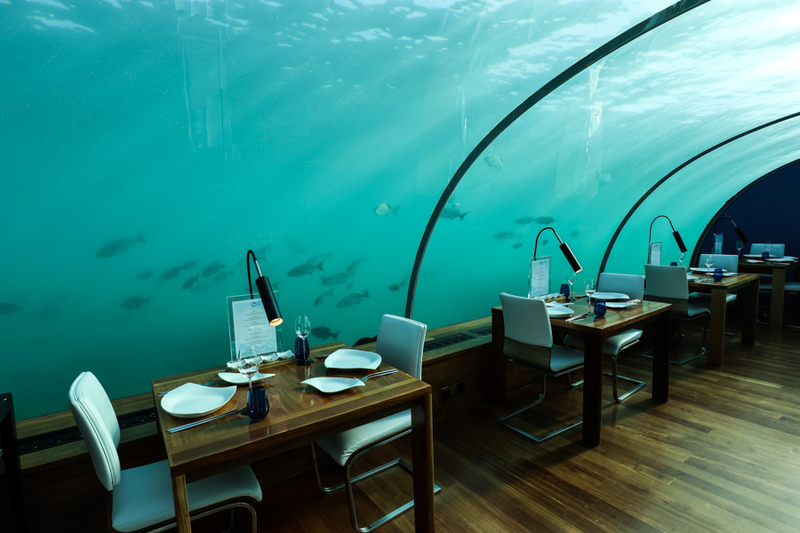 Here you can dine underneath a shoal of fish a twirling sting ray or a inquisitively beautiful shark. 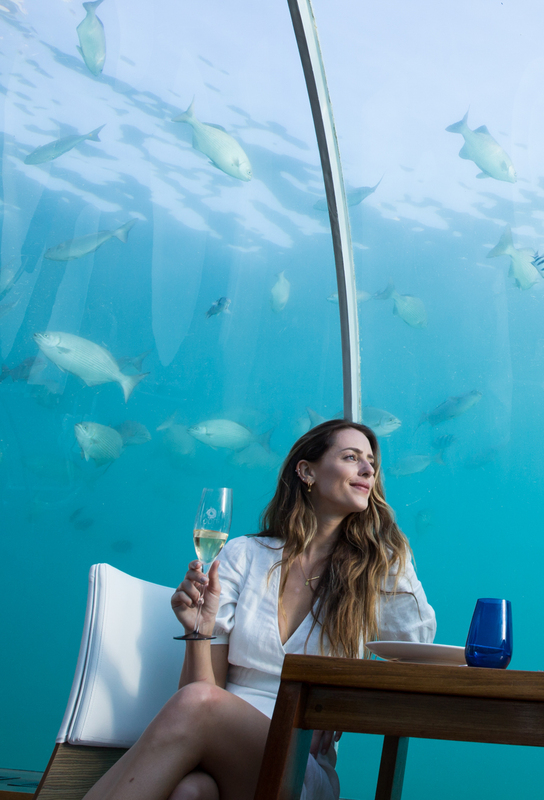 With the option to enjoy daytime champagne and canapés or a full meal setting in the evenings, guests who aren’t even staying at the resort can make their way out to The Conrad to experience the ultimate bucket list dining experience. The photo opportunities here are endless and oh so necessary, Ariel we CAN be both parts of the world! 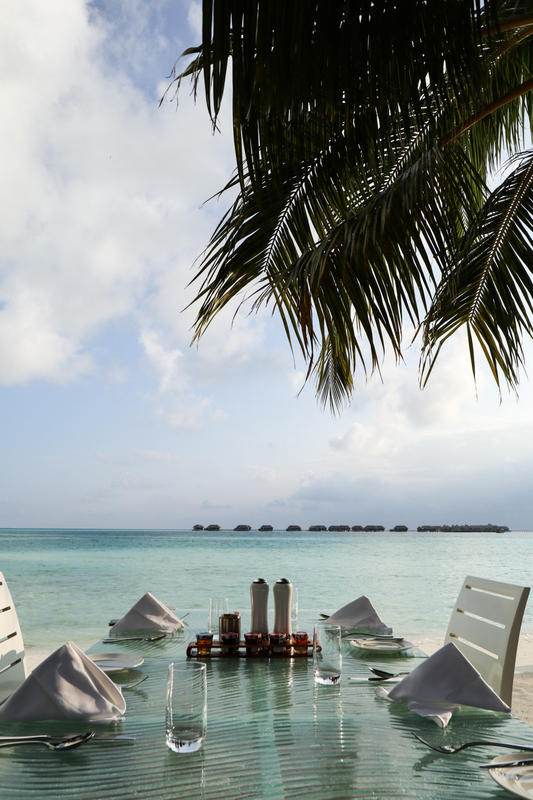 On top of every extravagant meal and all the luxurious physical touches the backbone of the hotel is without a doubt the island’s staff. 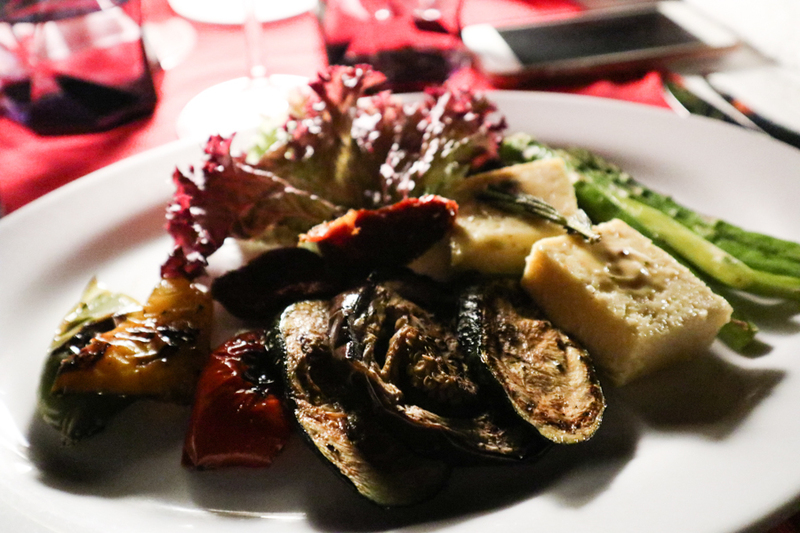 Their ‘nothing is too much’ attitude towards each and every guest is something that most hotels will ‘aim’ to work towards but something that Conrad has absolutely perfected. 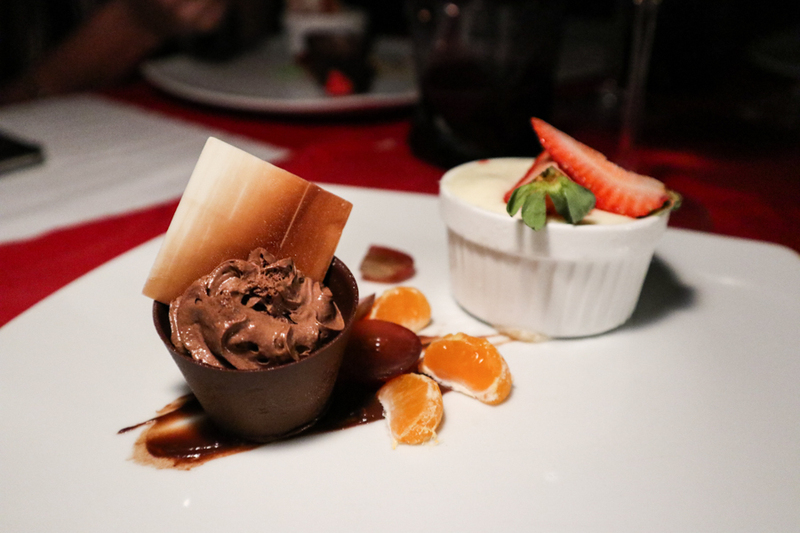 Every member of the team is outwardly recognised and valued and the knowledge and friendliness of each lady or gent I encountered heartwarming and fully appreciated. 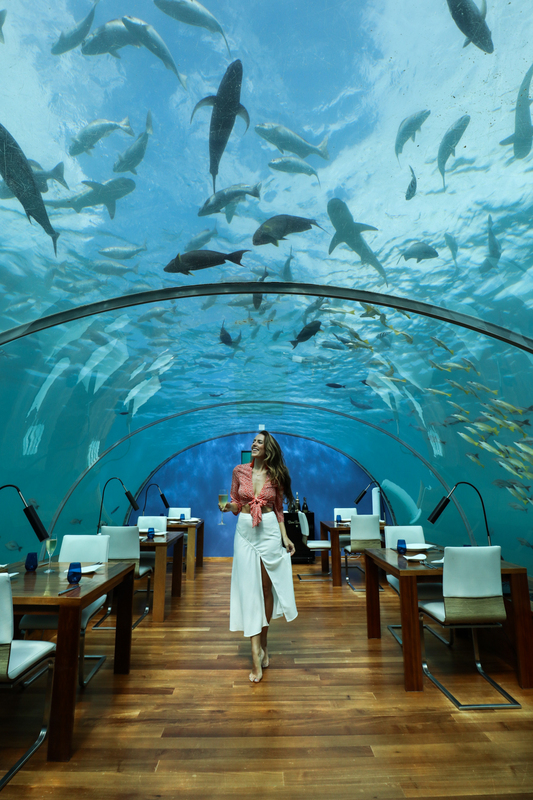 Everything is possible at Conrad Maldives and my paradise dreams come true and develop on every visit, even after my fourth visit I’m desperate to get back there! I can certainly see why you’ve returned so many times! !